A few weeks ago, folks started sending me this link via Twitter regarding a cocktail and mocktail competition hosted by the folks at Marx Foods. The rules were pretty simple. Once you sign up, they send you a sample of some of their spices. Using at least one of the samples per drink,you had to come up with an original cocktail and an original mocktail. It sounded like an interesting exercise, so I thought, what they hey, let’s enter this thing. About two weeks after emailing my interest, I received a package containing my samples. It included dried pineapple, juniper berries, saffron, (Indian) long pepper, fennel pollen and dill pollen. I was super excited about the long pepper because I’ve always wanted to experiment with it in cocktails. Long pepper is a little hotter than regular black pepper but has this beguiling aroma that is hard to explain. It’s almost sensual and velvety. And it just screamed TEQUILA! But I didn’t want to infuse tequila with the long pepper because I wanted to be able to control the overall long pepper use. Instead, I created a long pepper syrup. Take 8 long peppers and crush them in a mortal & pestle, a meat mallet or some other heavy object. Add 1.5 cups of sugar, 1 cup of water and the crushed pepper to a sauce pan. Bring everything to a boil, turn down the heat and simmer for 5 minutes. Add half an ounce of vodka to the syrup for preservative purposes. Bottle. It will keep in the refrigerator for about 2 weeks. *If after using the fine mesh strainer and cheese clothe there are still particles floating in your syrup, bottle the syrup and allow to settle for a few hours. Then carefully transfer the syrup into a new bottle keeping the sediment in the first bottle. -Combine all ingredients into an iced filled shaker. Shake vigorously for a slow 10 count and double strain (using a Hawthorne and fine mesh strainer) into a chilled couple glass. Pour one drop of Peychaud’s bitters on the foam and run a pick through it for a quick design. See the photo above. Now that we have the cocktail, time to turn our attention to the mocktail. There could be any number of reasons people don’t want to have an alcoholic beverage including religious, medical or moral. I’m sure some of these folks still want to head out to a bar with their friends or experience the scene at the hot new cocktail bar in town. Regardless, they shouldn’t be subjected to soda and a squeeze of lemon or soft drinks or fruit juice and soda water. They should still be able to enjoy all the complexity and balance that a proper cocktail provides. The mocktail should also be visually appealing, not just fruit juice and soda water. So the first think I did was decide how to make it visually impressive without relying solely on run-of-the-mill fruit juices. After some thought, I went with beet juice. The bright red-purple juice is both earthy and sweet. Not as sweet as fruit juice, but I know it would provide a great flavor and a great color. In to the juicer four beets went. So how do you get this complexity in a beverage without all the things the spirits bring to the table? 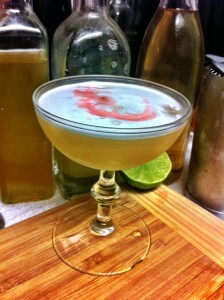 I’ve found that if not using spirits to add the complexity, you have to turn to more labor intensive culinary tricks. One of my favorite spirits, and one of the most complex, is gin. With it’s various botanicals and styles, gin adds so much to a cocktail other than alcohol. I knew I wanted to replicate the complexity of gin in my mocktail. Here is where you need some special tools for this mocktail. First, think about botanicals that are commonly found in gin. Juniper berries (hey! I got some of these in my samples! ), lemon, orange and coriander are common gin botanicals. Then you need a cream whipper. This iSi Whip Plus is the one I used, but whatever the brand you want to make sure it is charged using N2O gas. Take all of these botanicals and crush them in a mortal & pestle or with some other heavy tool. 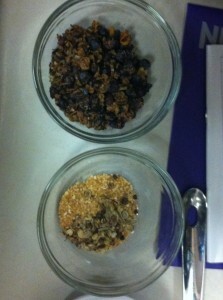 Add the crushed botanicals to the whip cream canister. Add three cups of filtered water. Apply the lid and charge using a N2O. Gently swirl the canister for 30 seconds and then allow to set for 30 seconds. After that, quickly release the gas from the canister. For a more detailed set of instructions and explanation of the science, check out this article. Once you’ve vented the gas, strain out the solids. What you’re left with is water flavored with traditional gin botanicals, or, non-alcoholic gin! -Combine 1 tablespoon granulated sugar with 1 teaspoon fennel pollen. -Prepare rocks glass by rubbing one-half of the outside rim glass with a slice of lemon. Using a spoon, dust this part of the glass with the sugar-fennel pollen mixture. Fill the glass with ice and place in the freezer while preparing the rest of the drink. 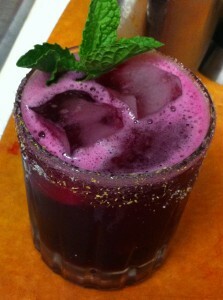 -In an ice filled shaker, combine the non-alcoholic gin, lemon juice, simple syrup and beet juice. Shake vigorously for a slow ten count. -Strain into your prepared rocks glass and fill the rest of the way with soda water. Gently stir. -Garnish with a fresh mint sprig. There you have it. A beverage containing the complexity of gin, the flavor and visual appeal of a great cocktail without the alcohol! Thanks to Marx Foods for letting me compete in this contest. If you try either of these drinks, please let me know in the comments what you think.